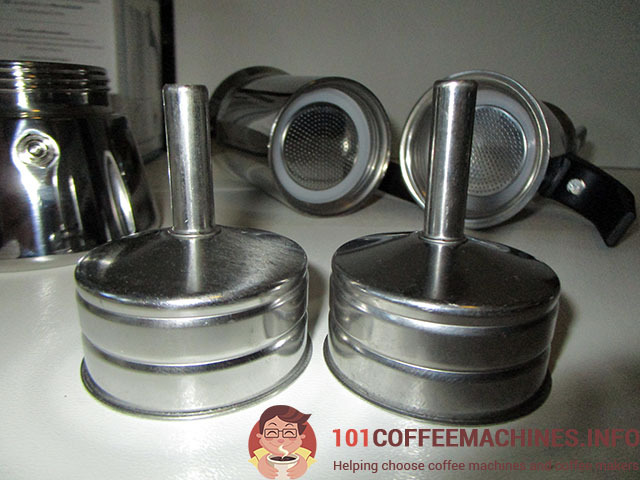 In the States you may find it in stock as a Stovetop Espresso by Túasia, AMFOCUS Stovetop Espresso Maker or VonShef Stovetop Espresso Coffee Maker. Similar Inox moka pots are sold also by Primula, BEMINH, Mixpresso Coffee, WeHome, MAYMII, MODIN and Maggift brands. All these models as I assume are OEM manufactured products. The “original” noname Chinese coffee maker is available on Aliexpress. Exactly the same model could be found in the UK. Here it is known as 6-Cup Espresso Coffee Maker by Kurtzy (ATWFS, Linaatales, Tooltime, KING HOFF and Yosoo sell identical stainless steel pot as well). 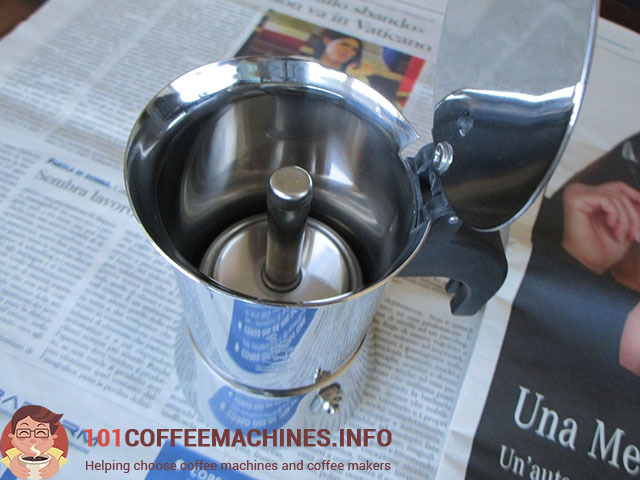 On the German market and in other European countries it is known as Generic Moka Espressokocher, Cuigu Edelstahl Moka Pot, HuntGold or UniqueHeart. In Asia (Indonesia as an example) they don’t bother to invent brand names and sell it just as namless stainless steel moka. If you will search for stainless steel moka pot on your local Amazon, then likely you will find more clones. They all look the same and, based on reviews anaysis, they all have similiar drawbacks, which I found in my specimen as well. Different weight changes the brewing procces, by the way. I will describe it below. I made a brief analysis of reviews and customer photos of all above mentioned clones (Primula, AMFOCUS, VonShef , MODIN, Maggift etc). Other people report the same, so it’s not just because my specimen was defected. Some people assume that it’s unbrushed steel. However, mainly due the specific smell (this fact itself could be listed in cons) I think that they put a layer of some non-stick coating inside. Either because it’s cheaper than polishing it from inside or because they use less chromium/nickel in the alloy (they are needed to make the metal stainless). That’s why inner parts that are constantly in contact with water have to be covered by some protective surface in order not to corrode. 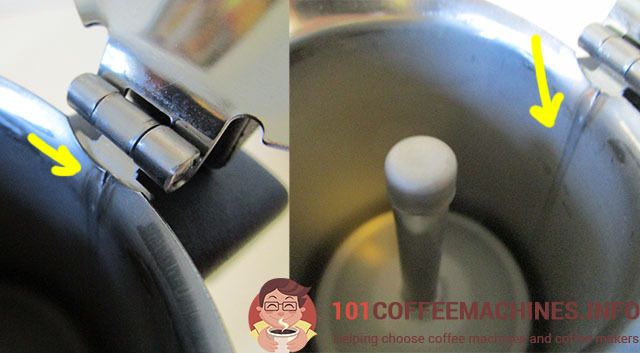 Anyway, the reason why Chinese-made moka pot has this covering is not so important. What important is that there is some strange smelly thing inside, not just the shiny polished steel. It’s attached with one(!) screw. No surpise, that users often report that the handle come off quickly. The Bialetti inspection valve is a patented valve, which has been designed to guarantee the use of the coffee maker in complete safety. 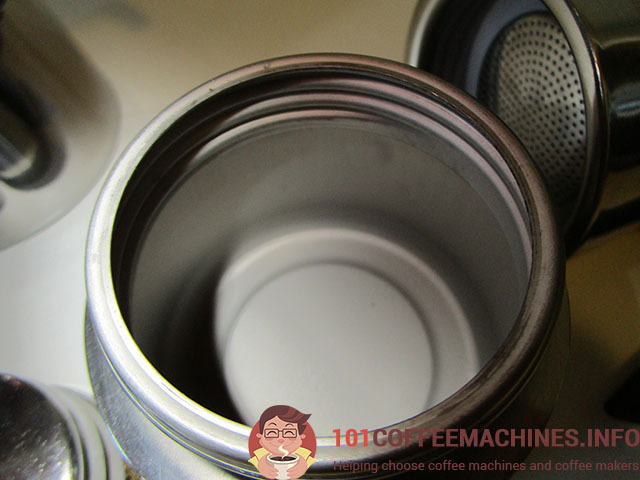 Using the coffee maker with drinking water entails the risk of formation of lime scale in the hole of the safety valve, causing the clogging of the valve itself and the malfunctioning of the product. With the Bialetti inspection valve, it is very simple to avoid clogging arising from lime scale: just move the small piston coming out of the valve along its axis when washing the coffee maker. As I mentioned above the fact that Chinese has thinner metal body affects the brewing proccess. 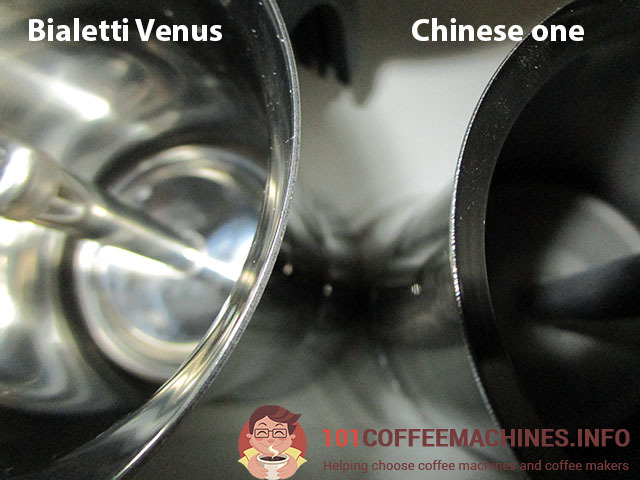 Bialetti’s upper chamber stays cools longer, while all parts of Chinese coffee maker becomes hot very soon. That means that temperature of extraction is higher on Chinese one. It’s generally condidered to be bad for the coffee taste (because it may become bitter), however it’s better for lovers of hot coffee. We have both Bialetti and Chinese. The Bialetti is much better built. The bottom of the Chinese one has blown into a dome which means it rocks on any flat surface , such as our flat cooker plates. So now useless. What about other Italian moka pot producer like Pedrini? Can you compare Bialetti and Pedrini? I want to know since Pedrini is cheaper than Bialetti. Hi, Ranu. Pedrini produces its moka pots in China, some of Bialetti’s moka pots are made in Italy (uncolored Moka Express and some limited series), others in Romania (all aluminium models) or India (all stainless steel models). In China they made only Junior Express (sub brand of Bialetti) and Kitty Nero. Plus Pedrino has a simple emergency valve, while Bialetti has improved one, which is more resistant to scale (but, honestly, it’s important only if you have very hard water). Nevertheless, Pedrini pots are still good, no smells or bad materials used like in some cheap Chinese coffee makers. P. S. You can check also Top Moka – another Italian brand with cheaper mokas. They have special shape of the bottom parts, which is claimed to heat the water faster. But I never tested it personally. And they still make it in Italy. I see.. thanks for the detailed answer. What about the Bialetti Break? 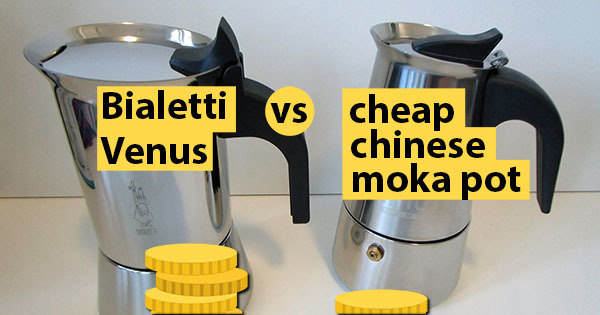 I notice that it’s the cheapest series from Bialetti. Is it made in China as well? It is made in Romania. At least one year ago it was like that, unlikely that something changed. Dmitry, thanks for the answer. I just bought Pedrini 3 cups today. And like you wrote, it was made in China. However, I liked it. Previously, I bought a cheap moka pot that was made in Korea. Pedrini looks better than the cheap one. You were right. No smells and it has better materials. Thanks for detailed review. Always wondered why my cheap noname chinese moka pot makes so bitter coffee, and tried to do something about it, getting it off the stove sooner than steam would come out. Turns out, I’d better change it at all. (so I did, and chose espresso maker). But, if I ever need moka, now I know what to buy.